All this writing about noodles makes me think about my first ramen experiences. Like most all Americans, my first encounter with ramen was with the packaged, instant Top Ramen. 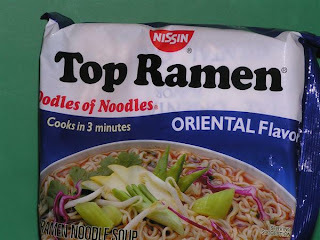 I remember at some point late in elementary school going over to a friend's house and having his mom prepare the classic Top Ramen Oriental flavor. About all I remember is that those were some delicious noodles, perfectly suited to the elementary schoolers' taste - soft, salty, unchallenging in every way...but with just a hint of exoticism. I talked my mom into keeping the kitchen stocked with Top Ramen, though only the Oriental Flavor - by dint of not being "Shrimp," "Chicken," or "Beef" I figured it was close enough to vegetarian. It was something of a special treat, as being "all chemicals" my mom was reluctant to serve it to me too often. Never could I have imagined that some day I would be living a mere ten minute bike ride from the Nissin corporate headquarters. Come to think of it, I should see if they do tours. As I grew older, I became able to cook ramen at home myself, and by the time I was in high school, I had developed a kind of "ramen" I am now ashamed to have eaten - "green tea ramen." Concerned about the negative effect of aforementioned chemicals on my health, I took to the custom of boiling the noodles and then serving them in green tea instead of the soup. Never again. 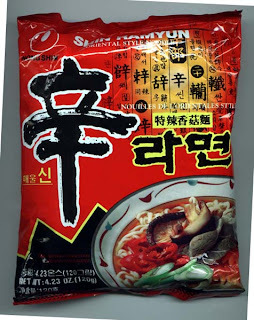 At some point I switched allegiance from Top Ramen to the Korean-style Shin Ramyun, which was my main squeeze all through college. I liked the extra spiciness, I liked the little cubes of unidentifiable quasi-vegetable matter. I experimented with other brands like Sapporo, and some obscure ones I found at the Chinese supermarket, but Shin Ramyun was my number one. By that point, my cooking skills had "developed" to the point where I realized that a little bit of extra work could turn a crappy package into a pretty solid little meal. I would cut up some green onions, toss in an egg, maybe stir fry some tofu as a topping and enjoy my ramen. By that point I had spent a year studying in Japan and had eaten plenty of "real" ramen, but my Shin Ramyun still hit the spot at home. My first experience with ramen was Kung Fu Noodles. They come with a "fat packet" which adds a touch of greasiness... and is delicious.